Saveen is a curious guy and a fan of automation, but he’s not a minister (afaik). Nevertheless, he has brought Twitter, Word Clouds and Visio together in a beautiful marriage. Hah! How many ministers can do three-ways? First, he mined Twitter for every tweet about Visio that he could find. Using the Twitter API, he was able to do this programmatically, and save off as many tweets about #visio as his code could get its hands on. Armed with a big pile of text, he then stuffed it all into an internet word-cloud generator: Worldle. If you’re still not sure what a word cloud is, take a peek at the thumbnail for this article, or have a look at Wordl’s Gallery, or just *bing* for “word cloud”. 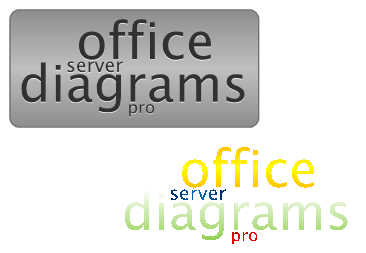 The next step was to get the word cloud into Visio itself to complete the process. The first step was to get a .PDF version of the word cloud. Since Wordle allows you to print your word clouds, Saveen probably used a PDF-printer utility to get the .PDF file, then went from there. Once he had the .PDF, he loaded it into Adobe Illustrator, then exported to SVG, or maybe WMF/EMF. Visio can import these files, so it was clear sailing at this point. Saveen also mentioned that he thought InkScape could be used to export PDFs to something that Visio could import. So what do you think? 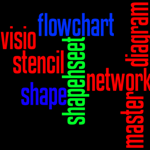 Does Visio need some Word Cloud SmartShapes? 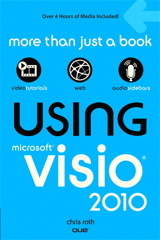 Perhaps something that can be hooked to linked data in Visio 2007 Professional. Or perhaps a utility that generates word clouds from data, directly in Visio. Let us know if this is something you want or need in the comments below! Previous Post: « Need Network Shapes? Fill Your Cup at the Visio Cafe!